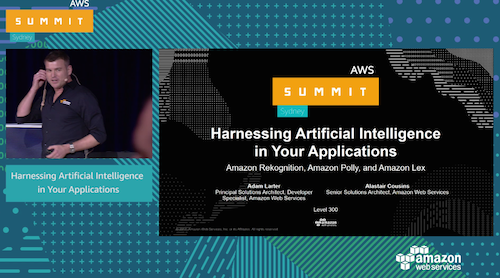 AWS offers a family of AI services that provide cloud-native Machine Learning and Deep Learning technologies allowing developers to build an entirely new generation of apps that can see, hear, speak, understand, and interact with the real world. In this session we take a look at Amazon Rekognition, Amazon Polly, and Amazon Lex. AWS provides multiple messaging options that you can use to create scalable, distributed systems, implement event sourcing to unlock hidden context, and utilise CQRS for efficient data access. In this session we will look at various messaging patterns, and discuss techniques and use cases for Amazon SQS, Amazon SNS, Amazon Kinesis and AWS IoT in your application. Application developers need to deal with an ever growing volume of streaming data and the challenges of processing that data on a near real-time basis . This session will cover how AWS services such as Amazon Kinesis Streams, Firehose and Analytics, AWS IoT, AWS Lambda, AWS API Gateway and Amazon SNS can be used in a developer centric context to ingest, transform, process and visualise streaming data using serverless architectures. Windows and .NET-based workloads are first-class citizens on AWS. In this session, we show how you can easily move an existing .NET application to the AWS cloud and take advantage of it serverless capabilities. We will cover migration and architectural considerations for porting your C# application to AWS Lambda, and using API Gateway to create a façade for your application to safely make changes as you migrate. Managing and scaling hundreds of containers is a challenging task. A container management solution takes care of these challenges for you, allowing you to focus on developing your application. We will discuss how to run well-architected container based applications at scale on ECS. We will dive deep into scaling, custom scheduling and secrets management. We will also briefly cover extending ECS using Blox and some alternative container solutions that are supported by AWS. Every business needs a mobile app, and AWS has the tools and services to make it easy to design, build and test apps. We will cover authentication, authorisation and quota management using Cognito User pools and Amazon API Gateway; building apps from scratch that integrate with SaaS products using AWS Mobile Hub; testing physical devices using Amazon Device Farm; and reaching out to your customers using Amazon PinPoint. Serverless applications make it easy for you to run your code without managing servers. In this session, we show how to build a full development pipeline for a serverless application using AWS Chalice. We will cover using Chalice to author a Restful service, and deploying the application to multiple stages using CodePipline, CodeBuild and the Serverless Application Model. We will teach you how to test your code and troubleshoot issues. By the end of the session, you will have enough information to build a solid continuous delivery pipeline for your production Python serverless application. Continuous delivery makes teams more agile and quickens the pace of innovation. Too often, though, teams adopt continuous delivery without defining the meta components or putting the right safety mechanisms in place. In this session, we'll start from the meta components and transform a typical software release process into one that will scale and is safe. We'll use DevOps techniques like continuous integration, a variety of non-production testing stages, rollbacks, redundancy, canary deployments and synthetic tests. We'll use AWS services such as Lambda, CloudFormation, CodePipeline, CodeBuild, CodeDeploy and CloudWatch alarms and dashboards. This session will look at the challenges of designing and operating a distributed, serverless environment at scale. We will explore the general challenge of managing state and coordinating components, introducing the new AWS Step Functions service and the role it can play in reducing complexity. We dive deep into AWS Step Functions and demonstrate how they make it easy to coordinate the components of a distributed microservices application. Most applications on AWS use multiple AWS services. Currently debugging issues and tracing transactions across multiple systems and multiple AWS services requires a lot of heavy lifting. 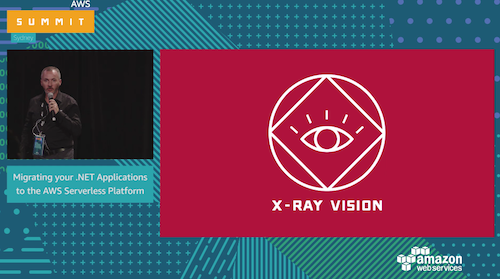 In this session we will cover techniques to help developers debug applications by combining AWS services like XRay, CloudWatch Logs, ElasticSearch, CloudTrail etc, to help isolate defects quickly and efficiently.